They're dependable, and they have excellent workmanship. They were very attentive to detail and very professional. He's done a few jobs for me, and on each job, the work was absolutely beautiful. They were recommended to me by some friends who were also very satisfied with them. They came out in the pouring rain to cover a leak in my roof and then replaced the whole thing as soon as the rain let up. I can't say enough good things about them. They are excellent. If you need a roof, call Joe Moore. The expedience with which they showed up was great, but I really loved that Joe worked with me, because I couldn't really afford a new roof but needed to get one. They're very nice, very good, very clean and very competent, but they're very expensive. I like their personnel and how competent they are. My neighbor was the one who told me that they were Diamond Certified. I hired them based on the job that they did for my neighbor. Joe Moore Painting & Roofing serves residential and commercial clients throughout Sonoma County. In addition to using top-quality paints and materials to provide general painting and roofing services, the company offers leak repairs and can obtain products from any manufacturer or supplier upon a customer’s request. 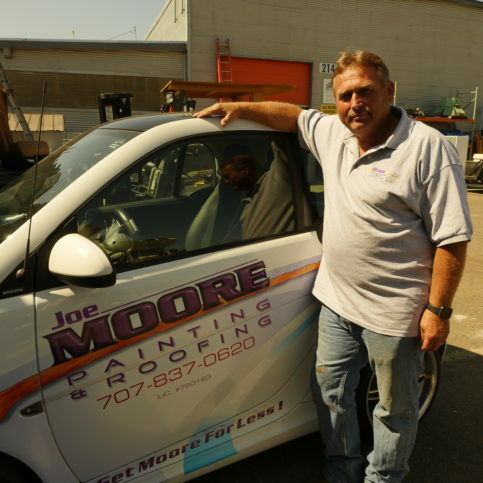 Owner and founder Joe Moore has been involved in the painting and roofing industry for more than 35 years. After honing his skills working for several of Sonoma County’s largest roofing companies, he established Joe Moore Painting & Roofing in 2000. Mr. Moore says he and his experienced team welcome the challenge of working on commercial and residential structures. Mr. Moore established Joe Moore Painting & Roofing after spending 30-plus years working for some of Sonoma County’s largest roofing companies and accumulating a wealth of industry knowledge that he applies to each project. He says the quality and care he puts into every job is reflected in how he treats his employees, all of whom have been with the firm for at least five years. “I’ve worked with my painters and roofers for a long time. They know the way I want the job done, and they adhere to that. If they don’t, they redo it until it’s right.” To supplement this meticulous approach, the company extends its standard two-year warranty in many cases, no matter how long it’s been since the original work was done. Preemptively checking your roof for signs of damage can eliminate the need for a costly replacement in the future. The National Roofing Contractors Association (NRCA) recommends you inspect your roof at least two times a year—spring and fall. The best place to begin is inside your house. Use some simple observation skills and look for places where the roof deck is sagging, signs of water damage or leaking, dark spots and trails, and outside light showing through the roof. • Visually inspect your roof for cracked, torn, bald or missing shingles. • Scan the roof for loose material or wear around chimneys, vents, pipes or other penetrations. • Watch out for an excessive amount of shingle granules (they look like large grains of sand) in the gutters—this is a sign of advanced wear. • Check for signs of moisture, rot or mold. Note that wet spots may not be directly under a faulty shingle; water can travel down to its lowest spot before it drips. Mold, fungi and bacteria can grow quickly—within 24 to 48 hours of a water-related problem. • Examine the drainage, and make sure gutters and downspouts are securely attached. Also, ensure all drains are open and allow water to exit, and all gutters and downspouts are free of debris. • Make sure all bathroom, kitchen and dryer vents go entirely outside of your home, not just into the attic space. If your roof has water damage, don’t immediately assume you need to start over with a brand new roof. The California Contractors State License Board says if your roof was properly installed and is less than 15 to 20 years old, it can often be repaired rather than replaced. Contact a licensed roofing contractor to get an estimate and hear their suggestions. If you decide to replace the entire roof, keep weather and other issues specific to your locality in mind when choosing materials. For example, wood and asphalt shingles aren’t especially fire resistant, which can be a problem if you live near a lot of dry brush and trees. Slate, tile and metal are more expensive materials, but they’re worthwhile investments because of the extra protection they offer against fire. Be aware, however, that some house framing isn’t strong enough to support the extra weight of these types of roofing materials. Q: Do you do roofing repairs or just replace entire roofs? A: We do both, depending on what’s needed. During the estimate, if we determine a small repair is all that’s needed, that’s what we’ll bid. We won’t sell you a new roof if you don’t need it. Q: How do you mix both painting and roofing? Don’t they require different skills? A: Yes, they are very different skill sets. We have separate crews for painting and roofing. Our painters paint, and our roofers are roofers. Q: How fast can you schedule a job? A: Usually quite quickly. We’re flexible and can almost always accommodate the customer’s schedule. A: Absolutely. We clean up at the end of each day and do a thorough cleaning job at the end of the project. If it’s a roofing job, we run magnets across the roof and property to ensure we pick up any stray nails that have been dropped. We always leave the home and property in better condition than when we started. Q: What’s your payment schedule? A: We get 100 percent upon completion of the job. However, on some roof jobs we ask for a progress payment upon delivery of materials. Joe Moore is owner of Joe Moore Painting & Roofing, a Diamond Certified company since 2005. He can be reached at (707) 837-0620 or by email. Outside of work, Joe has taken to a high-altitude hobby. “We just purchased an airplane, which will allow us to do more traveling and make it easier to visit friends and family,” he explains. “We also own a lake house, so we enjoy going there to relax and do some waterskiing when we get a chance.” Joe says he also likes giving back to his community. “My wife and I are invested in local youth sports—I coached youth football for 10 years and Dawn coached girls’ softball. Most weekends, we’re attending a football, baseball or basketball game, rooting for the local team.” Additionally, Joe likes keeping in touch with his and Dawn’s two children: Joe, who is pursuing a career in law enforcement, and Megan, who is attending college in Washington on a soccer scholarship. A: Hanging out with my dad on his fishing yacht when I was six or seven years old. A: Coin-operated banks and Mickey Mouse stuff. WINDSOR — Host, Sarah Rutan: Some of the most common types of roof leaks are also some of the most easily preventable. Today we’re in Windsor with Diamond Certified Expert Contributor Joe Moore of Joe Moore Painting & Roofing to learn about one in particular. Diamond Certified Expert Contributor, Joe Moore: We’re going to start by going over the system of a pipe jack. A pipe jack is a jack that is in the roof system where a pipe comes up through. Most people don’t understand; where their plumbing pipes come up through the roof, they have a jack on them. They have a rubber collar that usually goes on these. The rubber collar is one of the biggest sources of roof leaks. The biggest source of roof leaks is when these crack and the water goes down the inside of that. You’ll see leaks in the kitchen, bathrooms, wherever these are, laundry rooms, plumbing stuff. So, what we’d like to do is, we’d like to get these new rubber boots and put these on. They just slide over. You can get them on any of your roofing supply companies. This is an easy solution to save you money, in the long run, down the road. This could save you hundreds of dollars to have the roofers out. 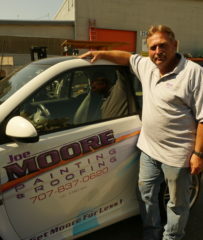 Joe Moore Painting & Roofing : Average 9.1 out of 10 based on 266 unique customer surveys of customer satisfaction. I would recommend them. I have recommended them to a neighbor in the past and would recommend them again. Use them. Call them, they did a great job. They were on time and quick. I think they would be a good choice for roofing, they were able to make things very simple. They were honestly just really easy to work with and efficient. Use them. They are by far one of the better contractors I have worked with in the past. They were very open to what we wanted and did their best to meet budget. Joe Moore is a very reputable roofing company. I can verify their high quality work and follow-through. They followed through with quality work. I thought they did an excellent job, I would recommend them highly. They came back and double-checked their work, which was nice. They can trust Joe Moore to get the job done. They did quality work at competitive price. Joe is a great guy and follows through with what he purposes. He even came out after the work to review what the guys had done, they did great. The guy who showed up and did the work was efficient and helped me save money. I would recommend them, they were fine. They showed up, did the work, cleaned up, and that was that, very easy to work with. They are great at what they do, always follow through with the work. That they have a lot of integrity and the quality of work they do is better than anything I have ever seen, they are not the cheapest, but you get more than you pay for. They painted my house 10 years ago and it still looks like it was painted last year. They do just about anything you ask them to do. They would be my number one choice to go to. The quality of the work, they finished on time, and they were available in a time of emergency. They responded quickly and I can't say enough about them.